What kinds of Strike Plates Are There? The strike plate is the little plate that goes in the door jamb where the latch or plunger would lock into. This piece is pretty important believe it or not. Without it, you wouldn’t be able to tap the door and it automatically lock into place. This piece helps guide the latch into the hole in the door jamb, without having to turn the door knob or lever. It keeps the door in place until the door knob or lever is turned which releases the latch. To fit the strike plate inside the door jamb, the wood has to be chiseled out to match the shape of the strike – making sure it’s flush to the jamb. Simple enough, but what kinds of strike plates are there? The full lip strike is the most common. As you can see there are 2 different kinds of full lip strikes: round corner or square. The measurement that this strike plate is showing would be considered the width, because it would be the width if it was on the door jamb. The width is measured from the screw hole to the edge, like shown above. Extended lip strikes look similar to the full lip, except it’s a lot wider. Sometimes doors require a deeper strike, possibly because the door is wider than the standard size. Can you tell by the name why it’s possible they named this style the T-strike? This is just another style of strike that some doors may already be prepped for. It’s not very common someone specifically asks for a T-strike just because, it’s usually because it’s already prepped that way. The circular strike is kind of a funny looking style, but if your door jamb is already prepped this way it will pretty much save your life. Deadbolt strikes are obviously different. They are used for the deadbolt, and they don’t require a lip because the bolt doesn’t strike on the plate like the latch does on the strike plates. It basically covers the part of the jamb where the hole would be and the bolt would lock into place. Dresses it up a bit. Most of the hardware comes standard with the full lip strike, but are available with pretty much any of the styles listed upon request. We have so many ways to help make it easier to find exactly what you need. Do you have a Skeleton Key Type Mortise Box? You may know what that is, but if you don’t… GRRREAT! Because I can show you. Requiring a certain prep for your mortise door, it slides right in. And the tubular latch would slide in the cross bore of the door. But that’s another post in it’s self. The skeleton key type mortise box is for those old fashioned doors. You know, like the one’s with the crystal or porcelain knobs and the key hole you can spy through, with those sweet skeleton keys. Yeah, those! We carry brand new replacement hardware for those type of doors. See more here. Or go under antique hardware on our site. Ever wonder how the latch mechanisms compare from brand to brand? Most people probably think very little about their door latches and how they are made, but I’m a door hardware geek, so it interests me. First of all, let me describe the three most common types of door latches today. I’ve included an image of how they look on the edge of your door so you can compare to what you have. The drive in latch is the easiest to install. You don’t have to chisel anything out of your door, just tap the latch into the hole (make sure the latch is placed in the correct direction) and you can install the knob or lever. If your door is already prepped for a larger faceplate, these won’t work. How do you know? If the edge of your door is smooth with just a 1″ hole for the latch, drive in will work. If the 1″ hole has a rectangular indentation around it where some of the door material has been removed, you’ll need one of the following types of latches. Pros: Super easy to install. No door prep other than bore hole and cross bore. Cons: Not quite as solid as larger faceplate styles, don’t look quite as nice. Rounded corner faceplate latches are pretty common. Door shops will often use a router jig to remove the material around the crossbore (latch hole). Because they are using router bit, the corners are rounded. Doing this takes a little more time for the door shop, but in looks nicer on the door than a drive in latch does. The larger faceplate also keeps the latch solidly in place as it’s position is held with 2 mounting screws, whereas the drive in latch can shift in the crossbore if it is not snug enough. Pros: Door shop can prep the doors so the install is easy. Looks nicer. More solid than drive in. Cons: If your doors aren’t prepped, you need power tools, jigs and some experience to do it. Square corner faceplate latches are standard on most higher end door hardware brands. These are generally installed the old school way using a nice sharp chisel and hammer. If done properly, a nice square corner faceplate latch chiseled carefully and at just the right depth looks the best. If you have rounded corner faceplates you can replace them with square corner by chiseling out your corners, but they usually look the nicest if you are starting from scratch, rather than retro-fitting. I personally like this look the best because it is nice and clean and I like square corners. Pros: Nice and Clean lock. More secure on the door than drive in. Can use these to replace rounded corner or drive in. Cons: Take a little time, patience and skill with a chisel to prep the door. Now that we’ve covered the main types of latches, lets get into the different brands and what type of latch they are packed with from the factory. Schlage – The nice thing about Schlage latches is that they design them so that they are compatible with all of the most common latch designs so they are an easy replacement. The Schlage latch shown here has the faceplate attached (packed with both square corner and rounded faceplate) but you can remove it and use the latch as a drive in instead. A great replacement lock. Schlage latches have adjustable backsets. Kwikset – Shown here is the drive in option on their latches. Kwikset also packs their latches with all three options, drive-in, rounded faceplate and square faceplate. Also a great replacement lock because of the flexibility of their latches. Kwikset Latches have adjustable backsets. Weiser – Also similar to the Schlage and Kwikset latches because they will accomodate however your door is prepped. Weiser was recently purchased by Kwikset so they may be packing identical latches soon. Weiser latches have adjustable backsets. Sure-Loc – Sure-loc latches are basically drive in latches with a removable rounded corner faceplate. You can request a square corner faceplate latch as well, but they are not packed from the factory with this type as the drive in or rounded is the most common. Sure-Loc latches have adjustable backsets. Weslock – Weslock latches in my opinion are the nicest latch for the money in the pricepoint their door locks are in – competing with Schlage, Kwikset, etc. The latch is heavy duty and adjustable by snapping off the end of the latch. 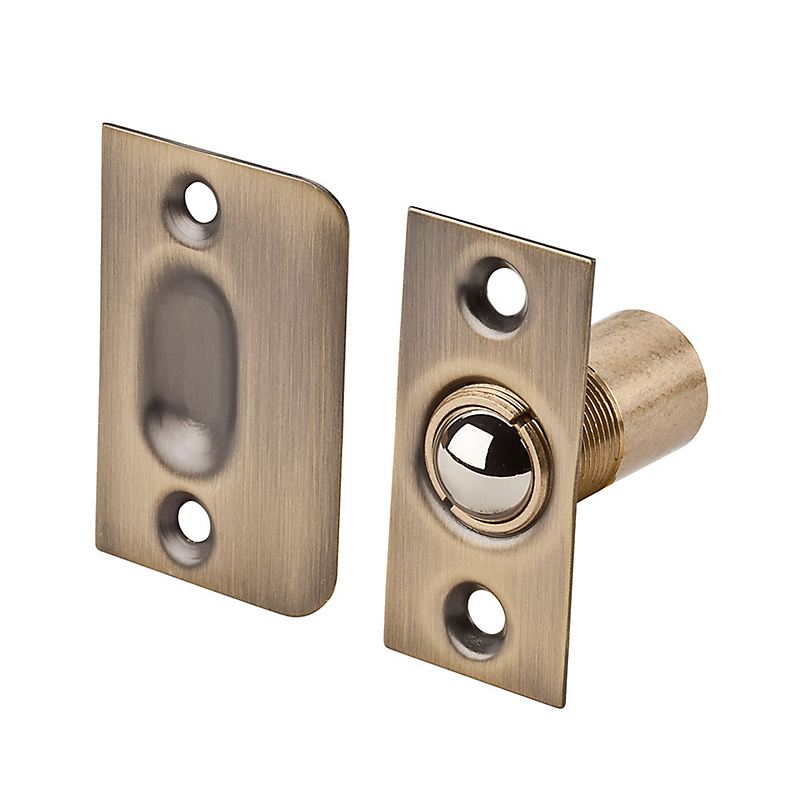 Weslock packs their door hardware with a latch and both rounded and square corner faceplate. Drive in latches are available upon request, but not standard. Emtek packs their hardware with standard square corner faceplate latches. Rounded Corner faceplate latches and drive in latches are available upon request. Emtek latches are not adjustable so you will need to specify 2 3/8″ or 2 3/4″ backset when you order. Grandeur, Nostalgic Warehouse and Baldwin all use latches that are very similar to Emtek’s Latch style. All are packed with square corner faceplates as a standard. You can request the rounded corner faceplate latches or drive-in. All of these brands require you to specify the backset upon ordering. There are many other brands of hardware out there which may have different latch styles, but hopefully this give you a good overview of the main brands. Most faceplates are 1″ wide and 2 1/4″ tall. The most important thing is that you double check what you have before you replace it. If you have ordered locks with the incorrect backset or latch type, we can just replace the latches for you rather than returning them all. A 5″ Backset isn’t super popular, but we do have customers asking for them quite often. we only have a 5″ backset available for Schlage and Kwikset brand items and these latches will not work with other brands. You’ll want to verify what brand of lock that you have before ordering. Check out the 5″ Backset options below. We have included some images of what they look like and links to the pages where you can order them.